Bodybuilders have known it for years. Now we have the evidence. You can increase the engagement of a muscle just by thinking about it. Focussing on the target muscle, even visualising it working, will increase neural drive to that muscle. This is especially important for the muscles we can’t see – the muscles of the back and posterior chain. It’s easy to focus on a muscle when you can see it in front of you or in the mirror. But the all-important posterior chain muscles are under-utilised if you don’t focus your mind on them when you are training. It’s easy to focus on the mirror muscles – but what about the muscles you can’t see? Take the pull up as an example. 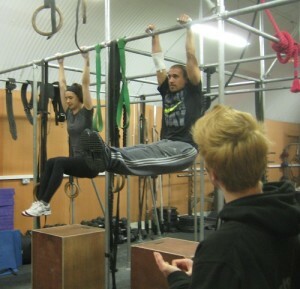 When most people perform a pull up, they focus on the arms because that is what they see in front of them. This increase s neural drive to the biceps. However, if you focus on the back muscles when performing a pull up, you will increase neural drive to the lats and the other muscles that pull the scapula back and down – lifting your body towards the bar. When you are next in the gym, make sure you focus your mind on the muscle you want to target. Visualise it working, see it in your mind’s eye. You will feel that muscle more than you’ve ever felt it before!